Everyone loves a good heist flick. At a running time of twelve minutes the very first Hollywood blockbuster was Edwin S. Porter’s The Great Train Robbery of 1903. In the 21st century the genre received a boost from Steven Soderbergh’s 2002 remake of the Rat Pack film, Ocean’s 11 (1960). Sequels were to follow in 2004 and 2007. Another stylish old heist movie, The Italian Job (1969), was remade in 2003, while a new version of Jules Dassin’s classic Rififi (1955) is allegedly “in development”. After Oceans Thirteen Soderbergh declared the series was complete. This Hollywood maverick, whose output has alternated between arthouse experiments and mainstream entertainments, said the team wanted to go out with a bang. Yet Soderbergh showed recently that he still has a fondness for the heist genre, with Logan Lucky, his first feature in four years. Now we find Soderbergh listed as producer for Ocean’s 8, with Gary Ross in the director’s chair. It’s a sequel for the #MeToo era, with eight female actors in the lead roles, led by Sandra Bullock, who plays Danny Ocean’s sister, Debbie. It’s a brave move to attempt another blockbuster reboot with a predominantly female cast after the failure of Ghostbusters (2016), which is still trying to recoup its production costs. Some would say the problem with that film wasn’t a misogynistic rejection of the cast but a plausible reaction to cinematic mediocrity. 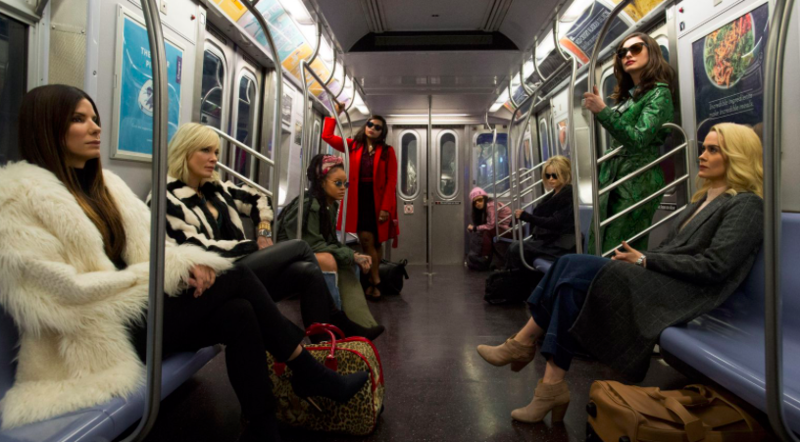 Ocean’s 8 is just as superficial, but a much slicker production. It would be surprising if it tanked. In comparison to Solo: A Star Wars Story, the other blockbuster of the moment, Ocean’s 8 moves along at a much brisker pace. Ross is not simply going through the motions with a reliable franchise but trying to make a classic heist movie with all the fairy tale elements we’ve come to expect from the genre. Part of that fairy tale is the multiculturalism of the cast. Bullock is the white, waspy leader of the gang who, miraculously, is more smooth-skinned at 53 than she was at 23. Cate Blanchett is Lou, a tough-as-nails scam artist. Sarah Paulson is Tammy, a middle-class housewife who has a sideline as a fence. After that it’s a study in affirmative action. Mindy Kaling, of Indian extraction, is Amita, a jewellery expert; Chinese-Korean Awkwafina, plays Constance, a thief with lightning hands; Rihanna is Nine Ball, an IT wiz who wears a rasta cap and smokes copious quantities of dope. Helena Bonham Carter as fashion designer, Rose Weil, gives free rein to an Irish accent. The mark is Anne Hathaway, who plays Daphne Kluger, a spoilt celebrity actress. This is the first Oceans film with no mention of a casino. The scene of the crime is the Metropolitan Museum of Art where the annual Gala has become one of New York’s most glittering social occasions. While art galleries are almost as common as casinos in heist movies the twist is that Debbie’s gang is not after valuable paintings, only a priceless Cartier necklace that adorns Daphne Kluger’s long neck. One presumes Cartier didn’t get such lavish product placement for free. Much of the fun of these movies consists of the twists and turns of the plot, as unforseen obstacles arise and have to be overcome, so I won’t dwell on the details. It’s more interesting to try and figure out what the story means to a mass audience. It probably comes down to two main processes: taboo-busting and entitlement. Ocean’s 8, like almost all heist films, tells us that crime does pay. It introduces us to a charming gang of crooks who relieve a snobbish, ultra-rich élite of part of their surplus wealth. The members of the gang are representative of America’s working-class aspirationals from various migrant backgrounds. Rihanna’s character, for instance, has impeccable black street creds, but somehow still manages to be a hi tech genius. This is, to say the least, unlikely. Neither can we believe there are many middle-class housewives like Sarah Paulson’s character, who have secret lives as purveyors of stolen goods. The pleasure lies in watching the social underdog outsmarting those who would look down on her, while an eminently respectable mum leads a life of crime. For a society trained to measure happiness in terms of lifestyle and consumer goods the heist movie is an exercise in wish fulfilment. It plays on that old lament: “Why them and not me?” As a get-rich-quick fantasy it’s right up there with winning the lottery. Because we all seem to believe nowadays that the banks are ripping us off, the politicians are hand-in-glove with big business, and major corporations are tax criminals, a heist comes across as an exercise in the equitable redistribution of wealth. It’s also an act of righteous revenge on a rigged, crooked system. There are not many places today where we can feel it’s possible to triumph over the forces of wealth and power. The cinema is one of the few remaining avenues that allows us to believe in natural justice – at least until the credits roll and the lights go up.